and I am going in the cool blue pool. every one of ya's...because you are THAT great! Oh, how I wish I could go for a swim too! My son said it's 84 degrees in Orlando. Wish I was there, lounging on the raft, soaking up the SUN! Sounds like a perfect day. Although it's in the 80's, the pool is a little chilly for me. I will be working on the gazebo on my lanai, listening to the sound of the fountain, gazing at the lake and just looking at the pool today. Then a fabulous alfresco dinner with a good bottle of wine. happy easter in paradise darling! Mmmm...sounds wonderful. The basket is beautiful, too... id you make it? love your basket and the peek at your poolside paradise! That basket is beautiful and I love your bunny's humor. The pool looks so inviting! I love that green basket!! I LOVE your Easter basket!!! I wish we could be there!! I hope your easter basket was filled to the brim! Hope you had a happy, warm and sunny Easter....it was a lovely San Diego day, no easter baskets, the teenagers aren't into them anymore, but plenty of wine and treats! oh that basket is so Hawaii...i love it, we should use our cultural arts more here, rather than purchasing those ____mart thingies! great idea! 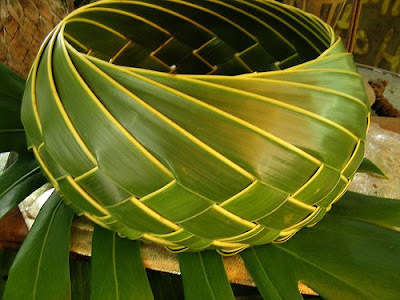 I do love the woven basket- will have to try with one of our palms-divine photos!Salut du MIdi! That door hardware is beautiful!